Aluminum honeycomb panel Facade, curtail wall, cladding. Compared to other cladding materials, aluminum honeycomb facade has unparalleled strong points. Aluminum honeycomb panel facade is all aluminum structure, a kind of green and energy-saving building materials, which is called as the best curtail wall material in 21st century. 2. Light weight, hyper strength, good rigidity, stable structure, wind pressure resistant. Thanks to the light weight of aluminum honeycomb façade, hyper strength and good rigidity, it is now widely used in interior and exterior decoration. Fifteen mm thick panel of 1mm face panel weighs only 6 Kg per square meter. With the same rigidity, the aluminum honeycomb panel’s weight is only one fifth of solid aluminum panel’s, and one tenth of steel panel’s. Interconnected aluminum honeycomb functions as numerous I shapes, distributed evenly in the panel. This structure makes the whole aluminum honeycomb façade panel very stable, not easy to be bended. Its wind-pressure resistance is much better than aluminum composite panel and solid aluminum panel. Furthermore, aluminum honeycomb façade does not tend to distort or deform, has good flatness. Even if the aluminum honeycomb facade panel is large-size, it can still keep superb flatness. 3. Sound proof, thermal insulation, fireproof and shake damping. That the aluminum honeycomb core is divided into many sealed cells blocks the airflow. It also blocks the heat and sound wave transmission. Its heat conductivity is only 0.0424/m.k, and energy-absorbing index is 150-3500KJ/M, while the noises-damping index is 20-30DB under sound of 100-3200HZ. In heavy rain, when the rain drops fall on solid aluminum panel or ACP, great noises will come out, while aluminum honeycomb panel can greatly avoid this. All in all, compared to ACP and solid aluminum panel, aluminum honeycomb façade panel as effectively solves the problem of noises making under rain and heat-transmission. Aluminum honeycomb façade panel of different specifications has very good flatness and doesn’t tend to distort or deform. HongZan-produced aluminum honeycomb panel uses pre-painted PVDF aluminum plate, which guarantees that the products have no color difference, that the quality is reliable, and that the façade color can be fresh for a long time. Long exposed to rain, sunshine and industrial pollution, the pre-painted PVDF aluminum honeycomb façade panel is cleaner and more shinning than spray-painting panels. Moreover, roller-painted aluminum honeycomb panel has very good adhesiveness and weathering resistance, which is widely recognized as one of the best building materials. According to different requirements, the honeycomb face panels can be replaced with different materials, such as aluminum panel, stainless steel panel. According to the architectural design from construction companies, façade aluminum honeycomb panel is fabricated into finished product of different size, shapes after cutting, grooving. Therefore, the installation is easy for the end-users. According to individual customer’s requirement, HongZan can tailor the aluminum panels into different thickness for different environment. 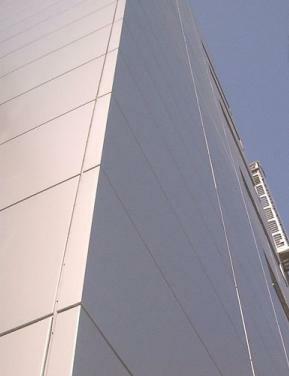 For high-rise building cladding, we have maximum 600mm thick aluminum honeycomb facade panel. For low building facade or interior decoration, we have minimum 4mm thick aluminum honeycomb panel.